Yes, trains, long considered antiquated and a quaint holdover from the past, have quietly and unobtrusively in recent years become the “in” thing with thousands of travelers. Hadn’t realized it until Connie and I boarded The California Zephyr at Denver’s rapidly changing Union Station on April 20. Actually, “rapidly changing” is a major understatement, for it is a stunning transformation. Even though the construction is still going on, it is the talk of the plains: A new upscale hotel is going in, buses from all over the region have been rerouted so they disgorge and pick up passengers in a large state of the art underground terminal directly below the train waiting room. Same for light rail. As a result, already over a billion dollars of new construction is changing the city skyline of what locals call “LO-DO” [lower downtown]. The initial news that Sunday morning was not good: the train would be two and a half hours late. We later discovered that a big fire had broken out near the tracks in the vicinity of Omaha. But not to worry, the train would make up a lot of the time later on. And it did: an hour and a half of it before we reached Sacramento. But the delay didn’t appear to bother anyone very much. Just accepted it as another example of what regulars label “AMTRAK time,” the result of freight train corporations owning the tracks, and consequently having priority over passenger trains. But, in reality, as everyone knows all too well, air travelers face jammed skies and weather-based delays and cancellations virtually every day, not counting mechanical problems—so, delay-wise, it can be a Hobson’s choice. Since it had been some years since we had last traveled by train, we wondered what it would be like in the Year of our Lord 2014. It was enough that finally here around the bend, the long silver city on steel wheels backed into the still-under-construction station. We were surprised to see how excited we were–it had been a long time since we’d experienced anything but dread and distaste over the prospect of boarding yet another flying cattle-car. So this was different. How different we didn’t yet realize. We quickly discovered that, as through-travelers to California, we were assigned a through-car. Not so for shorter-distance travelers who had to settle for potluck car-wise. But not to worry: they could later change seats if they so desired. Downstairs (adjacent to the restrooms) were storage facilities for large suitcases. No charge for them such as is true with most airlines today. The smaller case we could stow in the overhead above our seat upstairs. After picking just the right seats for the anticipated view, and then positioning our smaller suitcase or bag overhead, with a giant sigh of relief we took our seats and watched the scurrying around, including the boarding of the last passengers and train attendants–and the journey began. Unlike air travel, where only the person sitting next to a window can see out, here everyone can see. Furthermore, passenger jets fly so high today that rarely can even those sitting next to the windows see what is passing below; whereas in trains, the continually unrolling of the travel scroll reveals a world that’s only feet away–and not 40,000 feet away such as in airplanes. After a while, an attendant came through, checked to see if we were through-passengers, then wrote our destination down on a card and attached it to the overhead rack. Later on, we learned the reason for that: late at night, unless aroused by an attendant, some people sleep through their destinations. One young woman in our car, who was supposed to get off in Elko, Nevada, dropped off to sleep after being awakened, and didn’t get off until Reno; there she had to wait for the next eastbound train the following day. After we had been checked in, we were free to wander. What a difference from air travel where, most of the time, you remain strapped to your seat, and only get up for potty breaks. Even then, in the forward compartment, no one is allowed to wait in line. No such restrictions on the train. The most popular place to be is the observation car, for there you can look up as well as out. In our case, since passengers see two of the most beautiful mountain ranges in America (The Rockies and the Sierra Nevadas), in consecutive days, almost everyone jockeys for a seat in the observation car during those stretches. Especially was this true when traversing Colorado’s iconic Glenwood Canyon. The snack car too was almost always in use by someone. And then there was the Dining Car, where three meals a day are served. Reservations are easy to secure. Only when your number is called do you enter the Dining Car. Then you are seated. Unless you specifically ask to be seated alone, generally you join others already seated. We always prefer to thus get acquainted with our fellow travelers, for that’s what makes train travel so fascinating. Reminded me of the long-ago days when air-dining was such a pleasure; today, you’re lucky if you get pretzels, peanuts, or crackers. On the train, it is a leisurely affair–no one hurries you. Though you don’t dine on fine china, at least you have clean white tablecloths, and can order from a surprisingly large array of options. Even for vegetarians such as us. And the food was certainly good, and those who served us most gracious and interesting to talk to. And it was clear that they–and all the other train attendants we chatted with–loved their job. Many had worked for AMTRAK for much of their entire careers! So what a different world! No reason to be struck with deep-vein thrombosis that happens on long air flights, because everyone is free to wander. Children love it, for it’s like the entire train is just one long fascinating moving playground. In fact, a good friend of ours, who when he heard we were traveling by train to California, asked what we thought of train travel. After listening to my answers, he booked The California Zephyr west to Emeryville [San Francisco], and the coastal AMTRAK south. He and his family of four got off at Santa Barbara and drove up to President Reagan’s mountain hideaway; then drove on to Disneyland, after which they headed home by the same route. Later I asked him what he thought of train travel. He had booked a family sleeper [though AMTRAK travel is generally cheaper than air travel, sleeper compartments cost considerably more – sort of like traveling business class by air]. He said his kids loved train travel! In fact he said, they’d asked if they might always travel by train from here on! But our journey had just begun. 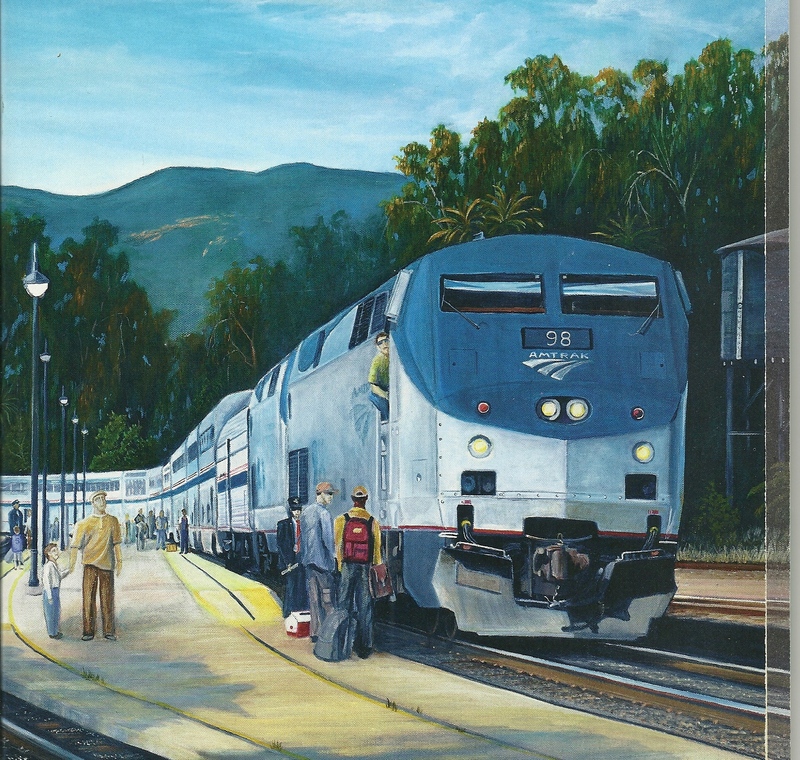 Part two of “Trains – The New Way to Travel” will resume on Wednesday, June 4; as next week we’ll break for Dr. Joe’s Book of the Month Club June book selection. By the way, there’s always lots of time to read on trains. I have so much more to share with you about why so many people – including young people (college age and young adults) – are gravitating to train travel today. See you June 4.